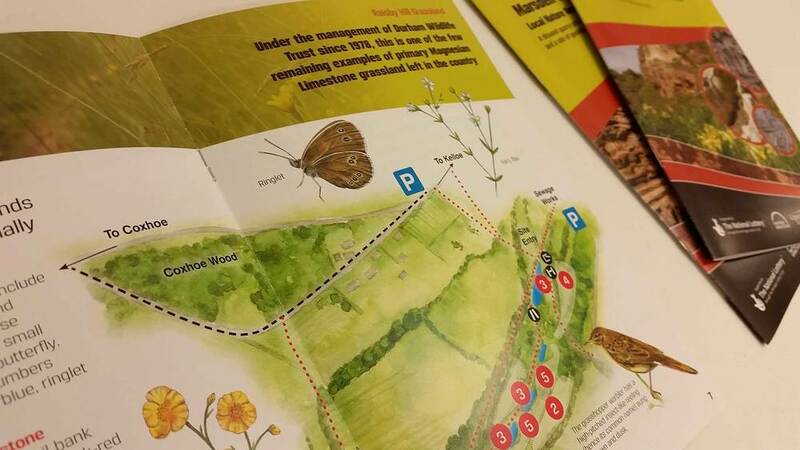 Some of the sites are managed as Nature Reserves by Durham Wildlife Trust and are special not just for the rocks but for the grasslands that inhabit the sites. Fulwell Quarry lies on a long thin band of Magnesian Limestone that stretches from South Shields to Northamptonshire. Never more than a few miles wide, this band was laid down 260 million years ago, in the Permian Period. The exposed limestone you see in the quarry today formed as horizontal beds on the floor of a shallow inland sea, known as the Zechstein Sea. Tiny pieces of shell and remains of creatures fell to the sea floor and a limy-mud was created, which eventually became the Magnesian Limestone. The concretions within the Magnesian Limestone, first noted by the local naturalist Nathaniel Winch in 1817, have been admired and their origin argued about by geologists for many years. These features are found within the Concretionary Limestone, one of the divisions within the Magnesian Limestone. It is currently thought that these have developed from recrystallisation. Fulwell Quarry displays a spectacular array of concretions, many of which including intricate patterns of bands and calcite crystals.